This massive design asset library offers over 10,000 icons and vectors to choose from. Icons might be small, but they’re a significant part of any design. 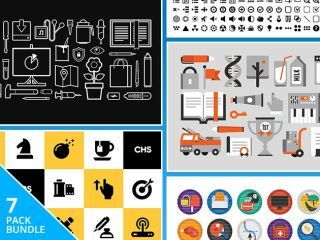 You can add thousands of them to your toolkit with the Web Designer’s Icon and Vector Super Bundle, now on sale for over 90% off the retail price. Great icons make your work easily recognizable and memorable, and the Web Designer’s Icon and Vector Super Bundle will give you just that. It’s packed with assets that are perfect for your next project, whether it’s for mobile or desktop. You’re sure to find exactly what you need in this collection of thousands of assets. The Web Designer’s Icon and Vector Super Bundle usually retails for $608, but you can get it for just $19 (approx. £14). With a savings of over 90%, this a deal that you can’t afford to pass up!